I know what you are thinking. Lyme disease? How on earth is this diagnosis possible? This kid really has bad luck ---- right? Luck definitely hasn't been on her side. As I continue to learn how a normal little girl could essentially "fall apart" and completely lose her ability to talk, communicate and function as a human being, I continue to be amazed by the intricacies of the human body and their requirements for flawless function. I first heard the words "Lyme Disease" as a diagnosis in May of 2010, and it was not for Olivia. I had never thought of it, and neither had the doctors (both conventional and alternative). What was even crazier was that I had never come across it in my research to find what went wrong and what could help. We have all heard about Lyme Disease in the news. I actually did know a child that had the disease, but in that instance he had those classic signs, mostly, I remember the severe joint pain. He had to be around 7 or 8 and his legs hurt so bad he could hardly walk, all in a matter of weeks from the dreaded deer tick bite. I think many of us think of Lyme disease as the debilitating joint pain with, of course, the classic red bulls-eye rash that develops on the site. What many people do not realize is that these classic cues to this disease only happens in 50% of the cases. So, what's crazier is that 50% of people with Lyme disease have no idea that this opportunistic bacteria could be the cause of their health problems! Neurological Lyme - no one really talks about the way this disease can effect people neurologically. To many conventional doctors to really "have" Lyme you must have the two major symptoms --- joint pain and a bulls-eye rash. Not always, and what a shame, since the 50% that happen to go undiagnosed usually end up with some sort of chronic disease. In children - behaviour changes, learning disabilities, headaches. With Olivia, I believe she was bit by a tick in the spring of 2005. Out of no where, in 2005, she started having really bad headaches --- I mean really bad. Walking, pacing, holding her head and crying,, sometimes screaming in pain. She had these debilitating headaches for a good year. I had to give her ibuprofen and Tylenol every 4 hours and she still cried and held her head. I took her to several doctors - even asked if they could be migraines but I was told over and over that people just don't have migraines every day like that. She was in ABA therapy, progressing..... but then, all of a sudden she just spiraled down and lost everything. The more I thought about it the more it made sense that Olivia could have contracted Lyme Disease. The headaches just "started" one day --- and continued for what seemed like eternity. When I first heard the diagnosis I admit I was skeptical. On the long drive home from the doctor's office, I digested the information I learned from the doctor. When I got home I hit the computer looking for any reputable resources and books to further my understanding. This was just the beginning. Confirmation after confirmation followed in the next several weeks. A week later I had a college friend and her daughter over for lunch and she started telling me about a woman that used to sub for her (she is a teacher) that she reconnected with the last day of school. When she saw her she asked where she had been. "Oh Julie," the woman began. "I think I have been to hell and back". She went on to say that two years ago her 30 year old daughter was not feeling good --- they thought it was just the flu. This flu just hung on, she felt as though she could not shake it. About a year into it the mother asked the doctor to test her for Lyme disease --- it came back negative. By April of this year the mother had to move in with the daughter because she could not even make it to the bathroom. She was tested for everything under the sun and she progressively got worse. Finally, she carried her daughter into the infectious disease department at Mayo and told them to figure out what was going on with her daughter. She told them that she thought it was Lyme Disease, but she had several negative tests. They just started treating her with the Lyme protocol and by June she able to walk normal! Later that week, I dropped Olivia off at a babysitters house. She told me of a friend of hers that had the infamous "bulls-eye rash", was treated with antibiotics but was never the same mentally. stimming ---- right on top of the mulch piles. Since that time, Olivia could not keep weight on, she is so skinny --- which is another common characteristic of "chronic" Lyme disease. I feel as though this may be another piece to her puzzle. She was already immune compromised and at the time doctors did not test for Lyme disease like they do now, plus back then you were really only at risk and tested (so they thought) if you had the "bulls eye rash". Minnesota ranks 8th in the nation for the number of Lyme cases. We tested Olivia through the medical community - and it came back negative. In the Lyme world that is of no surprise. The medical profession uses a test called the ELISA test which is known to report false negatives. And, as our doctor explained to me, unless you test within the first couple months of being exposed, the disease actually mutates and changes form so it no longer tests as an antibody in your blood. We chose to take her to a Naturopathic doctor who specializes in Lyme Disease. She ordered a more specialized test and a couple weeks later we got the results. Olivia was POSITIVE for Lyme! I knew something happened back in 2005. The bad headaches came out of no where and she has continued to get worse and worse throughout the years. 2005 is when her seizures became big grand mal's --- it's the year she was booted out of ABA ---- it was the year she started staying up all night, every other night. In a nut shell she took a dive and I never knew why. This bacteria wreaks havoc on your immune system. A weakened immune system isn't good for anyone, but for an epileptic it can be brutal. Seizure thresholds are lowered when the body is sick, which generally results in more seizures. In my opinion, Lyme disease is a condition that occurs because a person's total body load of toxins and other stressors has become conducive to the development of illness. As we go through life, we all accumulate a load of toxins from our environment. That load includes chemical toxins, electromagnetic pollution, geopathic stress, heavy metals, as well as emotional traumas. The sum total of all of these stressors finally creates a situation that makes a person susceptible to illness, so if that person gets bitten by a tick or mosquito that's carrying Lyme-related microbes, then it becomes easy for him/her to succumb to illness. Antoine Bechamp, was a contemporary of Louis Pasteur. Bechamp said that when it comes to healing the body, the microorganisms are nothing, and that the body's environment, or terrain, is everything. Pasteur, on the other hand, developed the germ theory, which is also called the pathogenic theory of medicine and which basically proposes that microorganisms are the cause of disease. Bechamp was a very brilliant microbiologist, whereas Pasteur was a flamboyant chemist. Even though Pasteur wasn't a microbiologist, he was more vocal and flamboyant, and his way of teaching practitioners at the time won out over Bechamp's. On Pasteur's deathbed, he acknowledged that Bechamp was right in his theory and that he was wrong; however, by then it was too late, because Pasteur's ideas were already being put into medical literature and journals of the time. Those ideas have been perpetuated in medicine to this day. What's interesting is that the woman who developed the Specific Carbohydrate Diet (SCD), which is the basis of the GAPS protocol was a microbiologist, just like Antoine Bechamp. In Olivia's case I tried many supplements, herbs and homeopathy - reaching out to the affordable treatment options offered in the alternative health arena. But what I soon found was that the damage to her system was just too pervasive for a supplement or two to reverse. Lyme disease is fashionable at the moment, as our medicine goes through fashions all the time; all sorts of problems are blamed on Lyme disease today. industrialised world: the bees are dying out. They are dying out from a couple of opportunistic infections, which they used to be resistant to only a few decades ago. Why? Because their immunity has been compromised by all the spraying of the countryside done by our modern agriculture. We, humans, are no different. When your immune system is not working properly, you become susceptible to all sorts of infections, which used to be harmless. conditions, despite the fact that tests may show that this bacterium is gone. Very powerful antibiotics are used to treat Lyme disease, often intravenously and long-term. Antibiotics are not harmless! Healthy bodily flora is the most essential factor in keeping your immunity healthy. Antibiotics will destroy that factor very effectively, making your immune system even more disabled, making you even more vulnerable to Borrelia or any other pathogen. percent of people, who test positive for Borrelia, have no symptoms and are healthy and well. Why? Because their immune systems are working properly! And make no mistake: well-functioning human immune system is infinitely cleverer, than any doctor or scientist! What every one of us has to do is to find a balance, a harmony between the myriad of microbes living on us and inside us and our immune systems. So, focus on feeding, nourishing and nurturing your immune system, rather than killing,attacking or eradicating anything. Her thoughts really line up with Olivia's journey. Just like a small snowball let go at the top of a snowy hill, her condition started small but rolled and rolled out of control until it became bigger, more complex, and finally ---- out of control, much to big to be tamed by a "miracle" pill. Something I find even more interesting is that Olivia finally did get that classic "bulls eye" rash, but not until I intervened with a radical switch in the foods that she was eating on a daily basis. I may have mentioned earlier that I did have her on the SCD diet back in the winter of 2005, well, MY version of the SCD diet. What I mean by this is that, I, like many parents in America believed that she, too, needed "treats" to feel good. Why is it that as parents we feel bad if our kid doesn't have a sweet treat to enjoy? Like we are depriving them of the good things in life to eat? So, when she was on the diet she had plenty of nut muffins, fruit and vegetables, but none of the "mandatory" healing aids that are well described in the GAPS book.......namely chicken broth, fermented vegetables and homemade GAPS yogurt. Is succumbing to that sweet tooth the only way to enjoy life? Anyway, three weeks after I took Olivia off all grains and potatoes ------- WALLA she got the bulls eye! 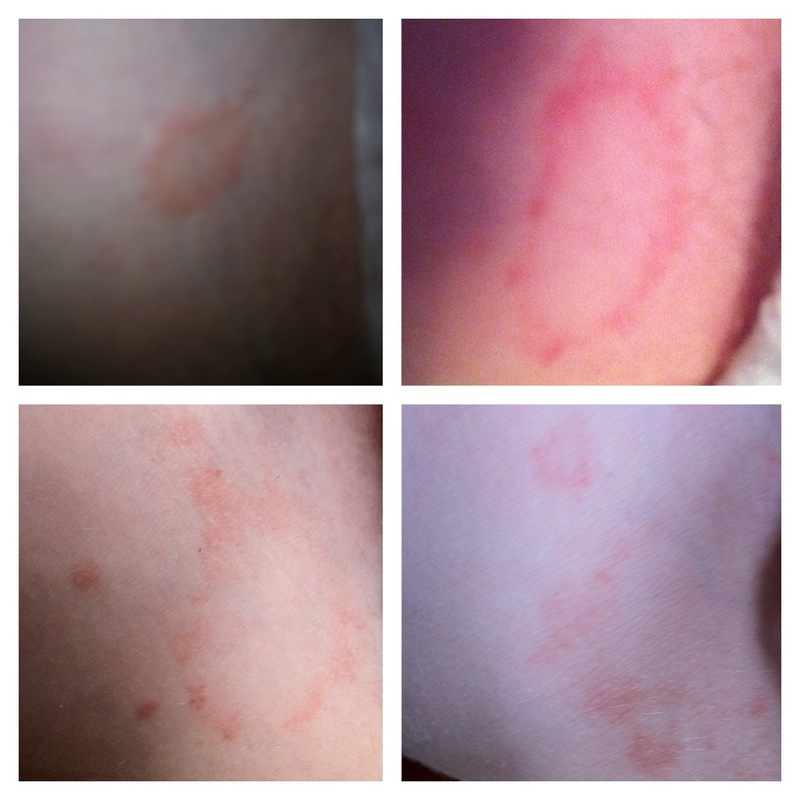 The picture shows the first sign of the rash in the upper left frame. In the following weeks, it spread out, and from the original bulls-eye small "shoots" went out, surrounding the circle. From there, the "shoots" became small bulls-eyes of their own. WOW is all I can say. I have learned that her getting the bulls-eye 6 years later happened because of the major shift I made in her diet. More and more, people in the alternative health industry are talking about how grains and starchy foods cause inflammation to spread in a unhealthy body. Taking Olivia off these grains and high starchy foods mobilized her immune system and it finally "recognized" the Lyme bacteria and set off the alarms (rash). Getting the rash indicates a healthy system, unlike Olivia's which resulted in the organism spreading more and more, year after year. Now, take a look at the following video of Olivia - do you see the similarities between her and Mary Hendricks? 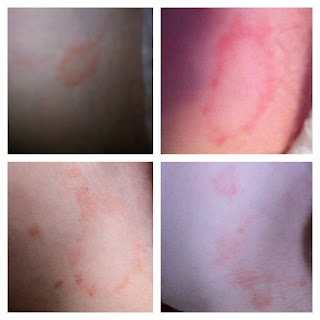 Hi dear I was diagnostic with lyme 1 month ago. I didn't have the symptoms until I was doing a strong treatment for other parasites maybe like your daughter something move the bacteria to the blood and then to my immune system reacted. I'm taking 3 types of antibiotics but I'm not feeling well. is your daughter taking antibiotics? Heart wrenching story! The Medicinal Cannabis has finally given you a mechanism to control the extreme Neurological Inflammation racing through her little body!Raising a child as a single mother is a challenge in itself, but what happens when you're also battling Lyme disease? A new treatment for Lymes is available and the success rate is very high, which is Stem cells treatment. Shopping at a Pharmacy Online will show signs of improvement bargains on Health Products, https://tadalafilgen.com/ for example, Vitamins, Supplements, Heart Health Products and Diet Supplements.